Today I am excited to be a part of the “Hookin’ Up Project” a crochet blog tour being hosted by Kathryn Vercillo at Crochet Concupiscence. I was lucky enough yesterday to have my blog reviewed by Rowena at An Open Book. I was thrilled by the review and can’t thank Rowena enough for all her kind words! Thank you, also, to Kathryn of Crochet Concupiscence for putting together this great crochet blog tour for the month of July! It was a wonderful idea and I have enjoyed reading and ‘meeting’ so many of the fabulous crochet blogs out there! 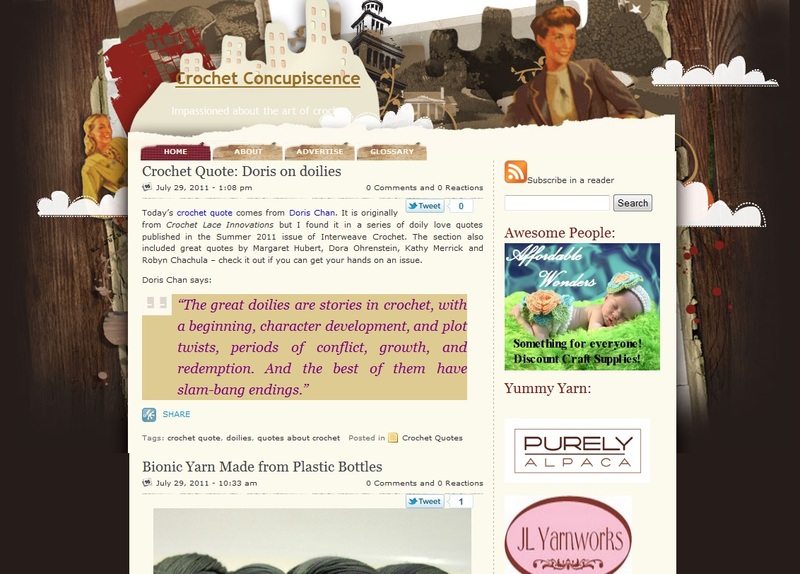 Now I have the distinct honor or reviewing one of crochet world’s best and brightest blogs, Crochet Concupiscence. 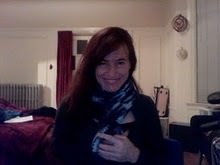 Kathryn is a blogger, writer and collage artist, based out of my most favorite city in the whole world, San Francisco! Kathryn brings a natural flair for writing to all her posts and I have followed her diligently since she started Crochet Concupisence! If you are like me, though, you will need a description of what her blog title encompasses! In its widest acceptation, concupiscence is any yearning of the soul for something good. The dictionary states that it is a noun and the second explanation lists that it means ardent, usually sensuous longing. Kathryn’s crochet blog is chock full of crochet yumminess! From crochet artist profiles to crochet book reviews, to crochet techniques and tutorials to crochet inspiration, to crochet on the runway and more, Crochet Concupiscence has it all! Kathryn has an unbelievable amount of crochet information on her blog and generally blogs SEVERAL times a day (yes, I said DAY). She helps us to keep current on the latest crochet trends, yarn, yarn stores and the newest things on Etsy! You won’t find more crochet information for the taking anywhere! To keep up with all this crochet goodness, you will want to follow her blog, as well as follow her on Twitter as @CrochetBlogger. On Twitter, Kathryn constantly shares the most wonderful crochet links. If you follow her, you will be kept up to date on what’s the newest in crochet. I learn something great about crochet every time I read a new post from Kathryn!